ProCam Services LLC. : Pro-Cam Services LLC. partnering with the National Championship University of Michigan Solar Car Team! Pro-Cam Services LLC. 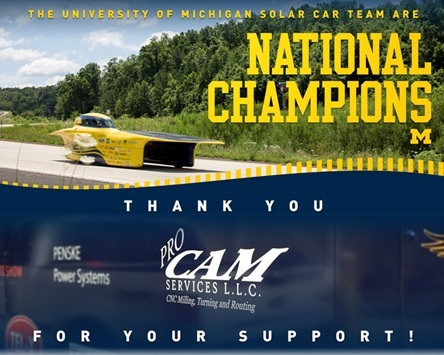 partnering with the National Championship University of Michigan Solar Car Team! Pro-Cam Services LLC. is partnering with University of Michigan Engineering and the National Championship University of Michigan Solar Car Team! Pro-Cam Services LLC. 's is providing machining services for the six-time American Solar Challenge Winner University of Michigan Solar Car Team. About Michigan Engineering: The University of Michigan College of Engineering is one of the top engineering schools in the country. Eight academic departments are ranked in the nation's top 10 -- some twice for different programs. Its research budget is one of the largest of any public university. Its faculty and students are making a difference at the frontiers of fields as diverse as nanotechnology, sustainability, healthcare, national security and robotics. They are involved in spacecraft missions across the solar system, and have developed partnerships with automotive industry leaders to transform transportation. Its entrepreneurial culture encourages faculty and students alike to move their innovations beyond the laboratory and into the real world to benefit society. Its alumni base of more than 75,000 spans the globe. 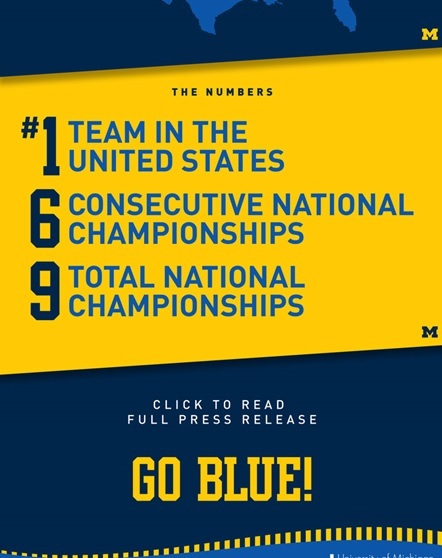 Reigning national champion, U-M has won the biennial race eight times since the team formed 26 years ago. 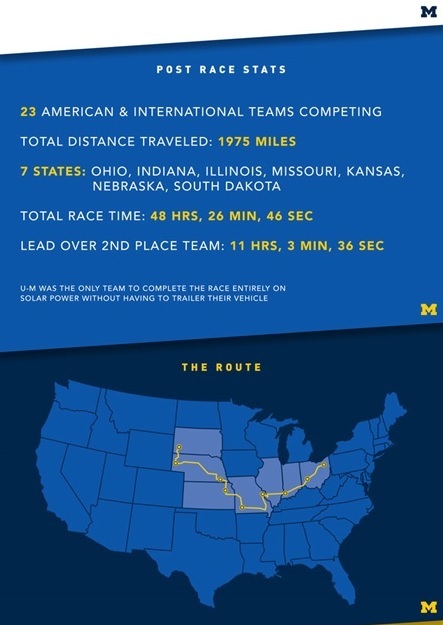 The University of Michigan Solar Car team is currently racing across the country in the 2016 American Solar Challenge. This 8-day, 1975-mile race pits Michigan, the reigning champion, against teams from all over the U.S. and Canada. It is a feat of engineering, and the student team put hundreds of hours preparing their vehicle, Aurum, for success.